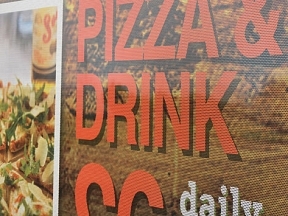 One Way Vinyl is a digitally printed, waterproof self adhesive vinyl and is used for many indoor and outdoor applications. 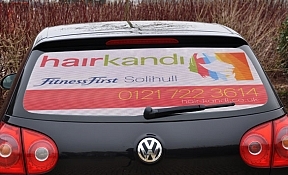 One Way Vinyl is used on glass windows for short term advertising or notices (often busses), the material allows for ‘one way viewing’ so you can see out of a window (through the adhesive side) but not into the window (printed side). 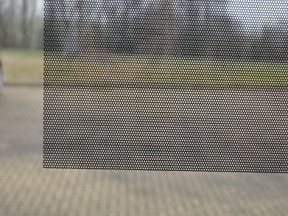 One Way Vinyl has many tiny holes in it to allow outward viewing, this makes it very easy to apply as the air escapes through the holes meaning no bubbles! 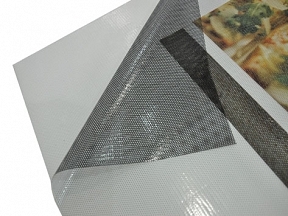 One Way Vinyl is supplied in rectangles and can be carefully trimmed during fitting with a steel rule and a scalpel.